These days, Google is a powerhouse for Internet technologies. If they’re not building brilliant search engines, they’re recreating email programs or reinventing the Social Media experience. We’ll look at what they are, how they work, and the benefits they could have for your business. Are you aware of what people are saying about your business or your brand on the Internet? Are you all over what your competitors are doing? Are you abreast of the changes in your industry? If not, Google Alerts will be a great tool for you. Essentially, the tool works by having you tell it what search terms you’re interested in. For example, you may be a property developer in Brisbane who wants to keep up to date with the local industry. You tell Google Alerts to send you new information regarding “Commercial Property Development Brisbane” and at the schedule you set, Google Alerts will send you an email with links to all the new Internet content relevant to those search terms. At the very least, we strongly suggest that you set up a Google Alert for your company name which will include all your brands and key personnel to monitor mentions about you on the Internet. Start using Google Alerts today. Want to try your hand at doing your own Search Engine Optimisation? Or, you may just want to know the words your target market are searching on when looking for your business, services or products. If either of these are the case, the Google Keyword Tool is your first port-of-call as it takes the guess work out of knowing what words people are actually searching with. To use the Google Keyword Tool, start by thinking about a keyword relevant to your business. If you’re a pipe supplier, you may choose “pipes” first. Type this keyword into the tool and a list of related search terms will be generated for you. In the “pipes” case, some notable results were “underground pipe”, “piping” and “hose pipe”. Couldn’t be bothered going to all this effort? Then let us do the hard work for you with our Search Engine Optimisation program. Google Places is one of the most valuable online tools you can use, particularly if your business services a local area. It’s free and the easiest way to get your website listed on the first page of Google. Google Places works by reading the IP address of the person performing a Google search, and produces results based on the companies closest to them. For example, if someone searched for “signwriters”, Google Places will produce a map of the nearest businesses listed as being signwriters- but only if they’ve registered themselves in Google Places. A lot of the time your potential customers will be searching for your service AND your location, so it is vital that you have yourself listing in Google Places. You are restricted to one listing per business address, so ensure this listing is optimised for all the primary keywords you want to appear for. Getting clients to make positive comments on your business listing is an excellent way of helping your results appear higher in these results. We highly recommend that all Bloomtools clients list their businesses with Google Places. Start using Google Places today. Google Docs is often compared to Microsoft Office, and understandably so. It allows for the creation of word documents, spreadsheets, presentations and more. Many of the formatting options and functions are similar to Microsoft Office, albeit Google Docs does not have quite the same range of features or flexibility. Despite this it is so much more cost effective for a business to choose Google Docs over other word processors and often the benefits out way the cons. What sets Google Docs apart from MS Office is the option for you to share documents with you coworkers. From a productivity point of view, this is a brilliant innovation. If two or more people within your company all need to make a change to the same document, Google Docs allows all the collaborators to open and edit the document at the same time, removing the need for multiple versions of the same document. It really does overcome the challenges with version control. Because all documents saved in Google Docs are hosted in the cloud, it also enables your off-site staff to access the documents they need without having to remotely access your server. Documents can be exported as Microsoft Office and Open Office compatible files, among other file types, and these document types can also be uploaded to Google Docs. Get started with Google Docs today, or check out their catchy little presentation that will offer some compelling numbers in favour of Google Docs. Even if you don’t think it suits you right now, check it out anyway as it may be a very viable option for the future as your business changes and grows. If you are wanting a professional version of Google Apps that includes Mail, Calendar, Documents and more, contact your Bloomtools consultant for more information or to get you started. 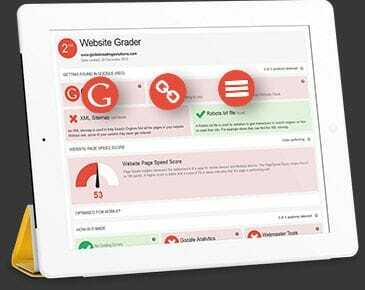 How well is your website doing? You don’t know? Well, it’s time to sign up for Google Analytics then. Google Analytics is a must-have for any website owner. It gives you valuable analytics on your website traffic, how you are being found online, which pages on your website are gaining the most popularity and it will even measure any goals you have for your website such as people signing up to your newsletter database or requesting an information pack. All this information can be used by you to work out how to make your website get better results for your business. For our website clients, we can’t stress enough the importance of having Google Analytics for your business. Go to www.google.com/analytics today to sign up. Then simply go to your settings area of your website and add in your ‘UA’ code you get from Google Analytics (more help here for Bloomtools clients). For non Bloomtools clients, sorry most of you will need to pay your web developer to add the Google Analytics code to every page within your website, as well as any future pages you may add. It’s risky business getting into the argument about which Internet browser is the best to use. You’ll always have die-hard fans of each browser as well as the crew that don’t really care so long as they have an Internet connection. I have to admit, though, that in the Bloomtools office, Chrome is one of the kings and that’s probably how it’ll stay. Google Chrome supports industry standard for the Internet, which is not the case for all browsers. As a result, people using Chrome will have fewer errors when visiting webpages that have been built to industry standards and the connection will seem a lot faster. Chrome also updates itself regularly which means your browser will not become outdated. In fact, Chrome is actually taking over the dropping popularity of the often buggy Internet Explorer. When our software developers make changes to thewebconsole (Bloomtools Clients websites backend), we do so with the most recent Google Chrome updates in mind, which means our clients using Chrome will have a much better experience using thewebconsole than those on Explorer or Safari. Google Chrome is available as a free download for Windows, Mac and Linux. Google Adwords is a form of Pay-Per-Click (PPC) advertising and enables businesses to appear at the top of a Google search for that business’ keywords. Have a look at the diagram to the right. When you do a search within Google, you’ll probably notice that two types of results will appear. At the top of the search results, and down the right hand side, you’ll see a list of results related to your search terms. These results are called “sponsored links” and are powered by Google AdWords. The rest of the results you see are the Google organic results and are powered by the websites’ own search engine optimisation program. With Google Adwords, you only pay when somebody clicks on the ad and you can set your maximum daily spend to ensure you remain within budget. You can also test and measure different keyword strategies and different bidding prices for those keywords to find the formula that works best for you. The benefit of Google Adwords is that you are targeting an audience that is already searching for your keywords and is, therefore, interested in your product and services. If you are not yet appearing high in the organic (free listing) results for those keywords, it may be a worthwhile investment as you wait for your Search Engine Optimisation to start working. However, the disadvantage of AdWords is that only 20% of all people searching will click on a paid listing as they know that the result has not appeared organically. Our advice for using AdWords is to make sure that the ad is directing people to a specific page on your website, not just your homepage. For example, you may attract people in your AdWord campaign by offering a discount on a particular product. If that’s the case, link your AdWord campaign to a page profiling that product, or your specials page, because this is obviously the information people are interested in. Don’t forget that 9/10 people will visit your website and not act, so include a sign up for for your newsletter on the page, or a downloadable “specs sheet” (or something that they will find of value, to give up their first name and email address for), which people can download after giving you their first name and email address. For Bloomtools clients, you may want to look at using AdWords in conjunction with Search Engine Optimisation. Your goal should be to appear early on the more effective organic (free) search results but appearing in the AdWords section can help you initially if you are not ranked high enough in the organic. Speak to your Bloomtools consultant about Search Engine Optimisation and how it can benefit your business. Check out Google Adwords today.